Named after the historical dye, gained from the excretion of sea snails. Usually Cobalt Violet pigments tend toward the reddish and/or magenta range. 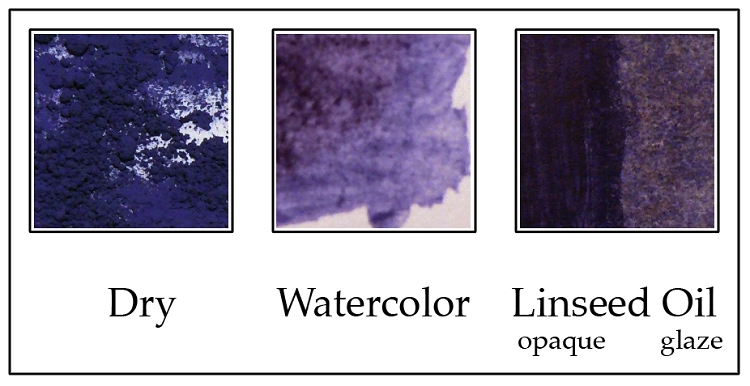 Not this rich bluish violet shade, which has the appearance of clotted dyestuff pigments and lends itself beautifully for creating atmospheric washes in oil paint. In water based media, the pigment glazes into stunning vibrant veils of color, brought to life by the stark white of paper or a gessoed panel. Suitable for all media, including fresco plaster and concrete. This is a very useful color to me for landscapes, particularly for shadows in foliage, and in tints for sky effects. I recently used it combined with French raw sienna light (actually a dark olive sienna) to create the colors of water in a stream. That worked very well. It is similar to Payne's Gray but leans more toward purple, a hue that is close to the old master's smalt. I'm very glad to have it in a pigment mix that makes it easy to make consistent batches. It's handling is "long," a nice paint behavior for some texture effects. My only complaint is that this is an expensive way to arrive at the color. I have been making my own mix using ultramarine blue, black, and purple, or ultramarine blue and a deep red, and they are very close (but ultramarine is a bit hard to make by hand, perhaps justifying cobalt blue instead). For the convenience of a pre-mixed, highly useful color, I will certainly continue to buy it. Q: I received my order of this pigment Tyrian Cobalt Purple and it has “imitation” on the label. I would have preferred to have seen imitation and rationale for this distinction on the web site. What exactly is this pigment and why is it imitation? A: The genuine Tyrian Purple is made from a dye that is extracted from a certain type of mollusk and costs thousands of dollars per gram. This is a modern day interpretation of this historical pigment, hence the "imitation" specification. Q: Can you tell me what its color index number is and if its lightfastness should be excellent? A: While we do not have an exact CI number for the blended pigment, it is in the vicinity of PV23. The pigment is completely lightfast. A: This pigment is composed of Cobalt Blue and an Iron Oxide Red pigment. Therefore, the same precautions should be taken that apply to working with Cobalt Pigments.